Summer 1992. I had just climbed into the back of my friend Marc’s car with my best friend April when our friend Johnny slid into the front seat with a cassette tape and said, “I’ve got something you’re going to like.” An electric guitar rang out an anthemic melody, repeating as the drums and rhythm guitar joined to fill out the sound. After a drum break, the song quieted briefly before a baritone as warm as the Texas summer night stretched out the word, “Son,” into two syllables, followed by the mysterious line, “Have I got a little a little story for you.” As Marc pulled onto the road, the song crescendoed and crashed repeatedly in his tiny CRX, that ardent voice leading us deeper into the sound. 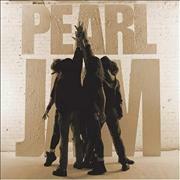 This year marks the twentieth anniversary of Pearl Jam’s iconic first release, Ten. It’s been nineteen years since I first heard the songs that summer night when I was barely sixteen, barely aware of a world beyond the Dallas suburbs in which we lived. During my first year of high school, I had joined a new group that included April, Marc, and Johnny, listening to alternative music by groups like Erasure and New Order. I was just breaking my mainstream country habit, tiring of those syrupy voices singing only about love, songs that reinforced my narrow adolescent worldview. But those Pearl Jam songs cracked open my shell. I strained to hear the words and felt each distinct instrument stoke my interest. My body hummed and roared with the music’s power, its sonic indignation. I wanted the car and the cassette to keep rolling into the night. Sure, the feeling was partially due to context. Riding around town with friends, watching the sky darken above us, the soft night air drifting through the windows generated a magical feeling. I was also tapping the energy of innocent flirtation with my new male friends. But it was the unique sound and, to me, new subject matter that hooked me. The schlocky pop lyrics of mainstream music had not prepared my mind for Eddie Vedder’s dense, cryptic lines and dark stories. Violence, injustice, introspection. While I missed a lot of meaning at the time, the absence of love impressed me. But what compelled me most was the careening sound—the wailing voice and guitars that veered from fuzz to focus, from near silence into sonic ascent that led up and out and up until I experienced the sound both inside and swirling around me. Without speaking to my friends, I drew closer to them as we rode the wave of the songs together. And when we arrived at our destination, and the music stopped with the engine, I climbed out of the car buzzing with a new energy, feeling a few minutes older, a few inches taller and just a little closer to the inky night sky arching above me. Sigh. Eddie Veder, Pearl Jam, 1992. You did a great job of evoking what it felt like to be that age at that time, with new music making its way into the ears, imaginations, and hearts of the world. Thank you. Wow, that really takes me back. I will always associate Pearl Jam’s Ten with that part of our lives. I remember those nights riding around in friends’ cars. It didn’t really matter where we were going. “Life’s a journey, not a destination…” was my favorite Steven Tyler quote at the time. Beautiful writing, Kelly. Great write-up, thanks! I can’t believe it’s been twenty whole years since Pearl Jam and Eddie Vedder’s iconic vocals first smashed their way onto the scene! Wow, just crazy. I still get an excited tingle down my spine whenever I hear the unmistakable opening guitar riff from Alive. So many good times and even greater memories. Great – thanks for the feedback! Looking forward to Eddie Vedder’s solo release on 5/31. by a technician who’s learned the trade through previous employment.